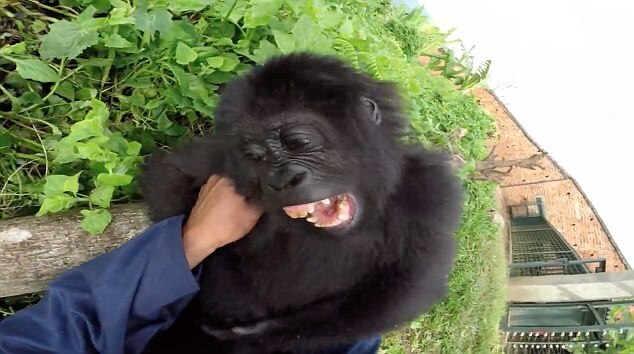 This is the moment an orphaned baby gorilla rescued from cruel animal traffickers starts giggling uncontrollably while being tickled. Lulingu, whose parents were killed when she was just eight months old, can be seen laughing while playing with one of her rescuers at a sanctuary in the Democratic Republic of Congo. The tiny creature rolls around in excitement and can be heard grunting as the carer tickles her under the armpits. The footage was captured at the GRACE centre which works to protect endangered Grauer's gorillas in the African nation. There are thought to be just 5,000 of them left in the wild. 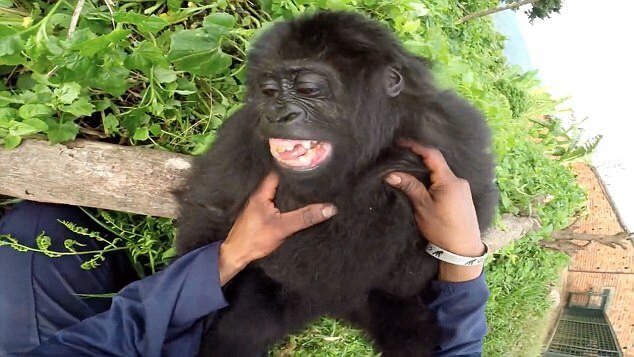 Lulingu was rescued from traffickers in the Virunga National Park in February 2016. Her mother and silverback father were killed as they fought to stop her being taken away. The video's narrator said: 'Caregivers strive to take complete care of babies. Baby gorillas like to play. GRACE is a centre that rehabilitates baby gorillas rescued from poachers. 'There are people who want to traffic these baby gorillas. Because of that, we had this idea to set up GRACE and ultimately, to reintroduce these babies back in a natural environment.